Durable materials, quality fittings and styled by function & purpose, the Kakadu collection encaptures the spirit & tradition of good old fashioned 'hard work' which are the foundations that Australia was built on. Genuine leather trim and straps with brass eyelets, buckles and snaps. Screen printing. 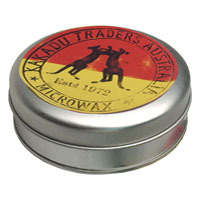 for Kakadu Products (with the exception of only a few items). Been around since they first started riding motor bikes in some form or another, there is sure to be terms that I use that you may never have heard before, so this will test your imagination. Think about this description on the front closure. 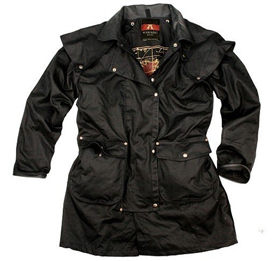 Double front storm plackets stop water penetration through the front brass zip. Top placket snaps down over the under placket which is designed to roll forward and form a drainage gutter channeling both wind and water out at the jacket bottom. Hook & loop collar tab stops collar slapping, pleated elbows, gusseted cuff vents with snap down adjustable tabs. Full shoulder to waist back riding pleats for ease of arm movement, removable waist belt. Front pockets starting at the top right hand is a snap down flap that covers a welted zip that is set into a bellowed patch pocket. The left side is for gloves so the pocket is designed for ease of entry, set on a forward angle and is again a double snap flap, covering a larger bellow pocket bag, the higher side of the flap is gusseted to stop water from entering the pocket. The two large bottom pockets are again different. Double snap fasten the extra-long flaps that form part of the closure to the bellowed envelope pockets. Fully lined in 100% cotton, stencil printed, with two internal security pockets. We took our nice new oilskin and stone washed the hell out of it for a few hours, made it look as if it had been around for a decade or so to give it that look of experience that only comes with time. 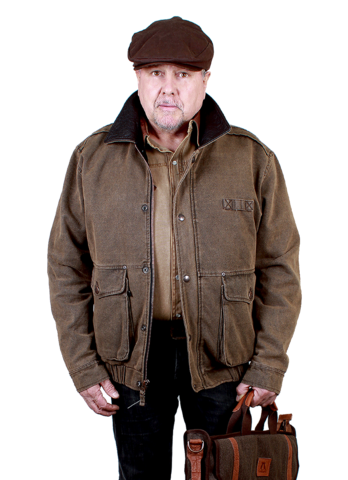 We call this "Scrubbed oilskin" Styled after one of our old hunting coats, where the brass zip runs up into the collar and the top storm placket buttons both sides at the collar to form a storm collar tab. Added protection come from the second under placket, removable draw corded hood, reinforced shoulder panels, and gusseted vents on the cuff. Back action pleats, draw cord on the waist and a large game bag fill the back. 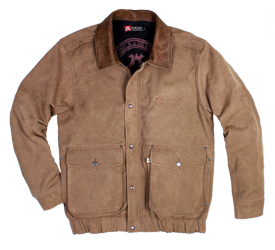 The front hosts cowhide hand warmer welts above the bottom bellow patch pockets that are flap and tack button down. These pockets also come with the traditional side entry pockets. Cotton lined and stencil printed with wicker lining around the bottom, and an additional five more internal pockets. Move over, it's the 5O01's little brother, again with all the goodies already built in. 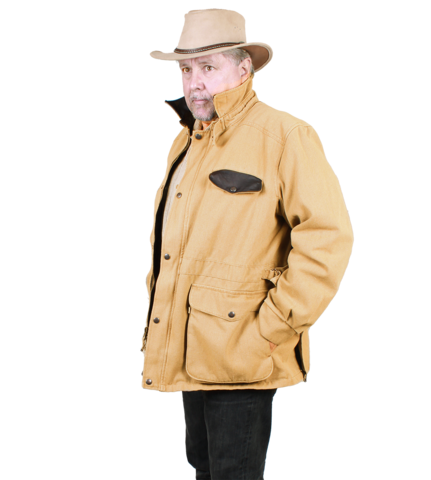 Brass hardware, cowhide collar and cuffs, detachable cape, double snap down storm plackets, bottom front riveted, snap-down flaps over the large bellow pocket bags cover side entry hand warmer pockets. 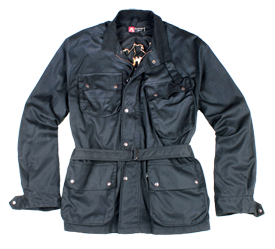 Again like our other oilskin garments it's lined with 100% cotton, stencil printed, two internal security pockets and our unique button-in lining facility .At the bottom of each front there are large double mesh storage pockets. The back of the coat features snap up double back vents. Ever been on the high desert plains, where it seldom rains, but the wind can howl and bite deep when the sun goes down, I have, so that's what this puppy was built for. 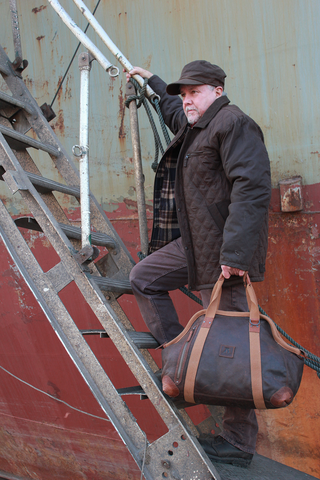 We used our 12oz washed gravel, brass hardware, cowhide collar and cuffs, detachable cape, double snap down storm plackets, bottom front riveted, snap-down flaps over the large bellow pocket bags cover side entry hand warmer pockets. The back of the coat features snap up double back vents. 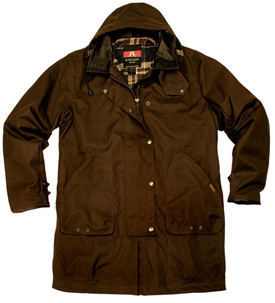 Again like our oilskin garments it's lined with 100% cotton, stencil printed, two internal security pockets and our unique button-in lining facility. 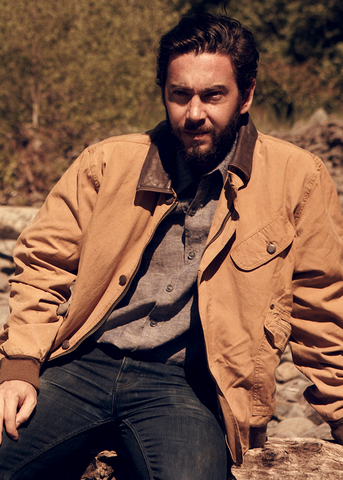 A timeless barn coat made from our rugged 12oz Washed Gravel canvas and accented with cowhide top flap pocket & collar, the Pilbara is both rugged and stylish. It has two large double stacked pockets with side entry for relaxed wear, adjustable waist and cuff tabs, action back pleats for full movement and a floating back yoke. Brushed cotton lined. Fabric: Gravel Canvas 12oz.with brush cotton lining. For when you need to look a little more formal. 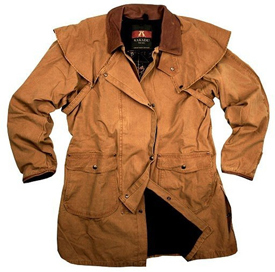 Crafted from 12oz washed gravel canvas, washable cowhide collar and trim, brass hardware, front zip closure covered by a snap down storm placket and sleeve tabs, action back pleats covered by a floating back cape for added movement, draw corded waist along with external waist tab adjustment, snap down back side vents, large bellow bottom patch pockets with side entry hand warmer pockets. This is a real dress up or dress down unit. Throw it over a pair of jeans, cargo's or chino's and you are ready to cruise. With a collar and tie you will be seen as a progressive professional, but always with attitude. Worn a little oversized, this bomber features cowhide trim, brass hardware, ribbed cuffs and waist band. The back is paneled with a twin stitched dropped shoulder and two pieced sleeve. Angled left chest pocket, built as a single lip welt and flap that buttons down using a tack button. A storm placket covers the brass zip and is anchored down again using tack buttons. Much of the front detail rests with the bottom twin needled patch pockets, the riveted flaps that covers them have been welted in the center to create internal hand warmer pockets, building texture on texture. The finishing touches to the garment come with the earth tones of the plaid we use as a lining, again, this garment has our two internal security pockets. The Aviator is a classic design with classic worn Kakadu flavor. 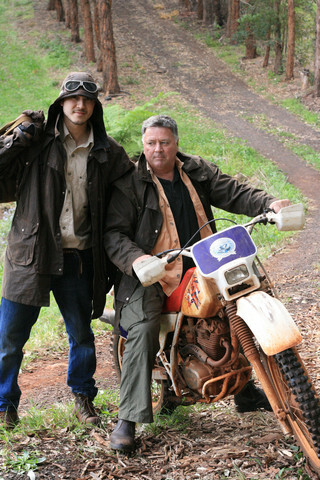 Built for cooler climates, the Gunn-Worn Aviator is built out of washed 12oz gravel canvas and features washable cowhide collar, brass zip closure, covered by a snap down front placket. Large bellow patch pockets cover riveted hand warmer welt pockets. It is full fitting with added back pleats for ease of movement, elasticated waist band and adjustable cuffs with the Kakadu stencil printed cotton lining and two internal security pockets. The art in concealment is in the normality. 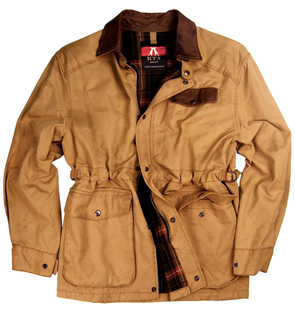 Oilskin built using 5oz cotton canvas makes it an ultra-light shower proof jacket. 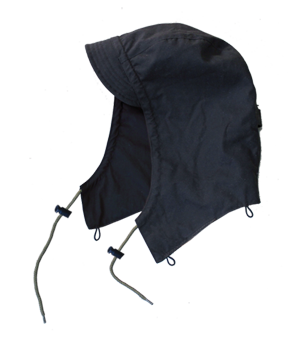 Features a fully adjustable hood that can be tailored to your head and when not in use rolls up to form a collar. Double storm plackets that snap closed encase the front zipper, the bottom front pockets are also designed so there is no leakage there with their zipper openings covered by storm welts. 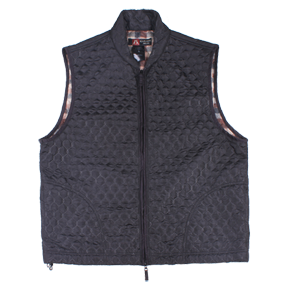 Fully lined using a fine mesh and features large internal front storage pockets. 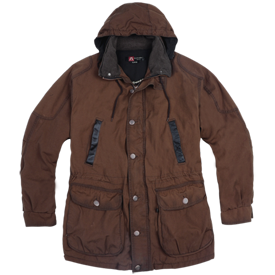 The lining is fitted with addition small loops for those colder climates that are designed to incorporate any one of Kakadu's button-in liners as an optional extra. Very Limited stock left ! 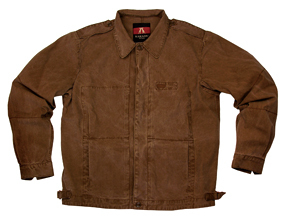 Fabric: MicroWax Oilskin 12oz. with brushed cotton lining. Light weight unlined jacket with multiple internal pockets for cell phone, camera, passport, wallet, glasses and all your other travel essentials. Fabric: 10oz. Gunn worn canvas. Work is work - no need to look pretty, just need something to protect you when the weather turns. 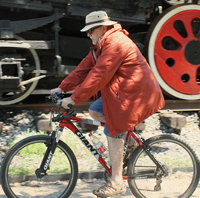 That's exactly what the Workhorse Drover's Jacket was built for. 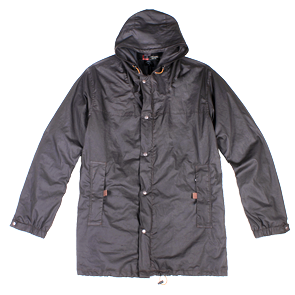 Made from Kakadu's legendary MicroWax oilskin, it has a detachable storm cape so rain just drips straight off, wide double front placket and cape, two lower flap pockets with side entry, and leg straps. Cotton lined. 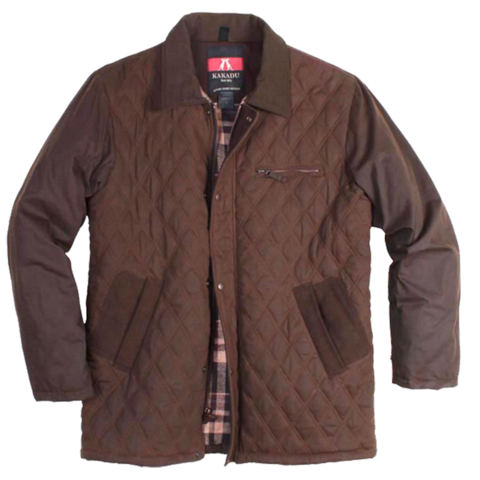 Features: Trimmed in brushed cotton canvas, this timeless quilted oilskin jacket blends you into any crowd. Both left and right front panels feature reinforced elasticised holsters which fully supports the weapon and two clips per side in concealed internal pockets designed for swift easy entry. Removable concealment shields for extra flexibility. 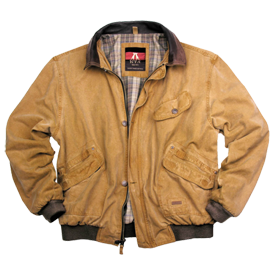 This timeless quilted oilskin jacket will keep you toasty and warm when its cold out without bulking you out. 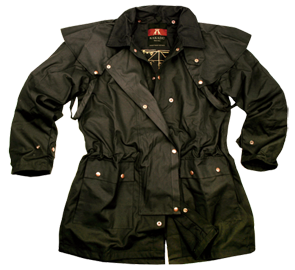 The main body is made from our specialty 5oz weight of oilskin that has been quilted then brush cotton lined for optimum warmth and non-quilted, taffeta lined sleeves that make slipping into the Hoover all the more enticing. 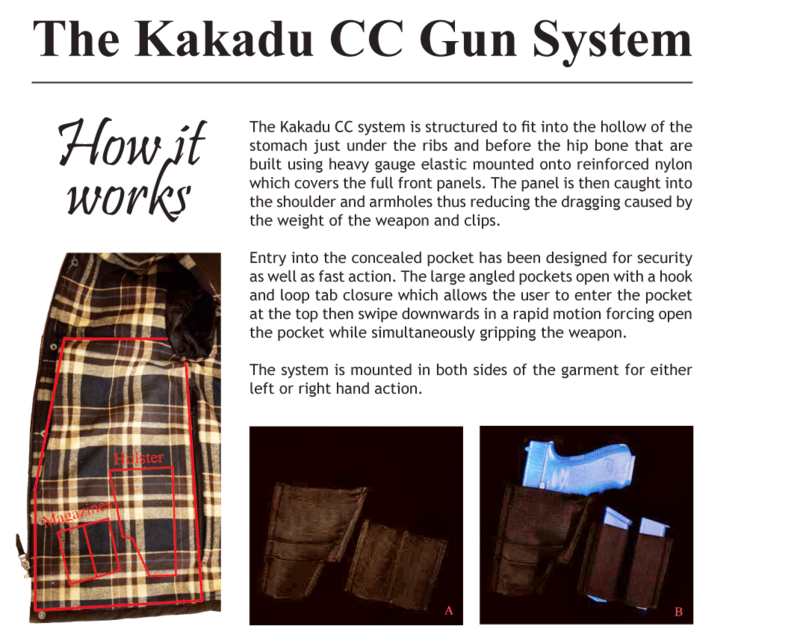 Both left and right front panels feature the Kakadu CCIS which fully supports the weapon and two clips per side in concealed internal pockets designed for swift easy entry. Adjustable waist and sleeve tabs, large front hand warmer pockets with external top zipped pocket . Brass zip front closure with the Kakadu snap down storm placket. Climate control - Aussie style. Ever been so cold that your bones ached, I have, and that's why we built this cooker. 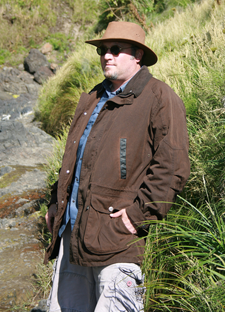 Buttons into our oilskin coats and jackets. The thick wool blend Sherpa traps the warm air molecules when it is incased inside these coats. 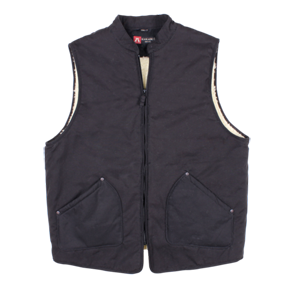 It also work well as a vest when you are not using your coat as the buttons that work for the button-in facility are on the inside covered by the front zip closure. The outer shell is our 12oz washed gravel and features a rink collar, large curved Sherpa lined hand warmer pockets that are riveted at the pressure points for added strength. If you want the warmth without the bulk or weight, here it is. Welded quilting, (sounds like something you would build in the shed) but it's not. This is a technique where the outer fabric is bonded onto the plaid fleecy inner fabric. The 8 internal buttons are prepositioned to go straight into any of our jackets or coats. Even the toughest need a little TLC sometimes. 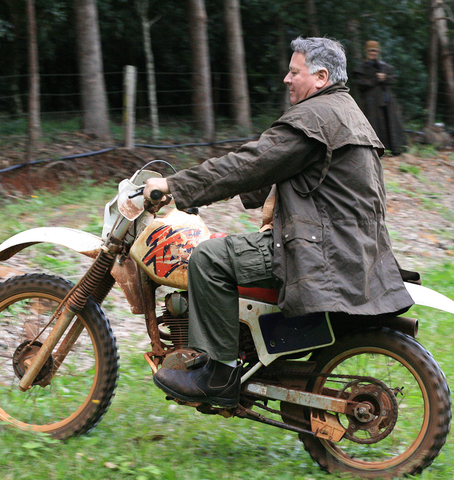 Kakadu oilskins are built to last, capable of enduring all manner of harsh weather conditions and tasks. 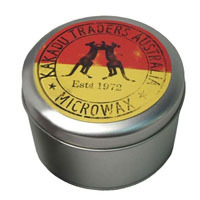 A whack of MicroWax Reproofing Creme from time to time will keep your Kakadu good as new. For touch-up jobs - on seams, elbows and other friction points - all that needs to be done is to rub some of the MicroWax into the affected area with a clean rag until its covered then hang to dry in a well-ventilated area out of direct sunlight. For the whole garment, the level of wear will dictate how often you'll need to reproof but if you're really pushing it to the limits then we recommend every two years. Unless you have a thing for car detailing, your best bet is to stand the whole can of MicroWax in hot water and, when liquid, paint the entire garment with a clean brush until it is well coated especially the seams. Hang the same way you would for touch-up jobs. And whilst your Kakadu is drying you can catch up on a little R&R yourself.